Entryway organizing is essential if you want to eliminate backpack, shoe, and sports equipment clutter and make quick school-morning exits a snap. Creating places in the entryway to store items you bring in daily is key to finding them the next morning. Most of us enter out homes through the garage. That's one reason why it's so junky. At the back door, we kick off our muddy shoes, throw down the umbrella, and toss in the ball we found outside the garage door. Whatever the season, we always need something. In the winter, it's gloves, hats and scarves. In the summer, it's sunglasses, raincoats, and hats. In this loading and unloading zone, you'll create convenient places to stash all this stuff. 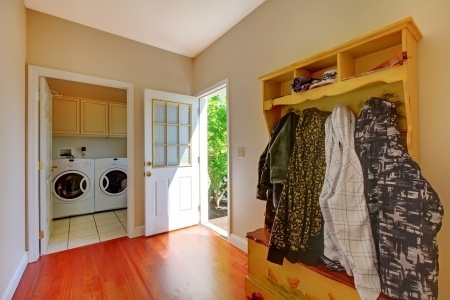 This is where the family will remove muddy shoes and hang up outerwear. Hang decorative hooks in pewter or gold near an entry door to give kids a quick place to hang up coats by themselves rather than throwing them onto the floor. Install a low shelf for depositing backpacks, lunch boxes, papers to be signed, and the rest of the daily clutter, to be sifted through and emptied later, once tummies are full. Put up decorative wall hooks for backpacks, car keys, umbrellas, dog leashes, and doggie bags. Hang a clean, dry (old towel) for drying Poocchie off on rainy or snow days. Also position coat racks for coats, cubbies for mail and newspapers, baskets for gloves, and large plastic tubs for sports equipment and lunch boxes nearby. Why should all this stuff be mucking up your kitchen? Busy families need lots of stuff: saxophones, tennis rackets, swim goggles, etc. And they need a place to stash it until they need it again. You do not want this stuff sitting by the back door for little ones to trip over. Ideally, the kids would walk over to the pegboard wall that's there just for this purpose and hang the tennis rackets on the appropriate peg; then they would walk over to the bin that's there just for balls and insert the soccer ball. And yes, that is something to strive for. But when they are going to be using the tennis racket again the next day, that might not happen. They're human. Avoid conflict and crashes and give them each a bin or space on the shelf that's just for their stuff. Consider making the space big enough for their backpacks, too. Tell your kids that they have to empty the bin or shelf once a week. But they do have that week's grace period. And Mom won't even look to see what's there. Bikes are so big and they tip over so easily they require extra thought. I have a rule that bikes always go in their prescribed "parking places." A friend of mine actually marked parking lines on the floor of her garage so her kids know exactly where to put their bikes. My friend never has to gt out of her car just to move a bike an inch. Another friend had her husband install one of those cool racks that suspend cycles from the ceiling. This is the perfect solution for occasional riders. Many families have a no-shoes-inside policy. Most families have a no-muddy-shoes inside policy. That means a lot of shoes piled beside the door. Here are some alternative places to put them. The good news is they won't be piling up in your closet or sullying your carpet or rug. Basket: If you have a small family and need a place for only a few shoes, just have a basket by the door. Shelving: If you have a lot of different kinds of shoes (especially athletic shoes with cleats or riding boots) of awkward sizes or a bigger family, just designate certain shelves for shoes. Add a bench so little ones can sit down while they take off their shoes, or so you can have a seat while you take off your little one's shoes. Shoe cubby: If you have a lot of shoes, invest in a closet shoe cubby to organize and store them all. Or try a shoe rack.